CHARLOTTESVILLE, Va. -- A memorial service was held Wednesday for a 32-year-old woman who was killed in Charlottesville when a car plowed into a counter-protest against a white-supremacist rally. Family and friends gathered at the Paramount Theater around 11 a.m. to share stories and memories of Heather Heyer. Many of Heyer's loved ones wore purple, her favorite color, in honor of her memory. 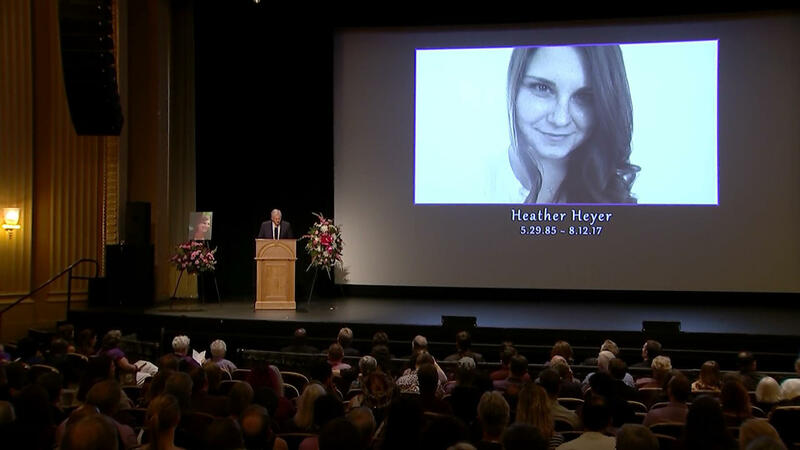 Friend of Charlottesville victim: "Heather didn't deserve this"
During the service, Heyer's father, Mark, said that "no father should have to do this." "But I love my daughter," he said. "And as I look out at all you guys, you loved her too. She's hard not to love." Through choked-back tears, Heyer spoke about his daughter's passion for equality. "All I remember is Heather's passion," he said. "She wanted to put down hate. We just need to stop all this stuff and just forgive each other. I think that's what the Lord wants us to do." "I came here today and I was overwhelmed by the rainbow of colors in this room," he continued. "That's how Heather was. It didn't matter where you were from. If she loved you, that was it. You were stuck. So for that, I'm truly proud of my daughter." Heyer's mother, Susan Bro, asked the crowd to "find that spark of conviction" and to "channel that anger into righteous action." "I think the reason that what happened to Heather has struck a chord is because we know that what she did was achievable," Bro said. "They tried to kill my child to shut her up. Well, guess what? You just magnified her." "I want this to spread," she said. "I don't want this to die. This is just the beginning of Heather's legacy." On Saturday, Heyer was rushed to the hospital after she was struck by the Dodge Challenger that plowed into a crowd of demonstrators. She later succumbed to her injuries. Nineteen others were also hospitalized following the attack. The driver, who authorities identified as 20-year-old James A. Fields Jr., has been charged with second-degree murder.